Designed and manufactured exclusively for Marine 31 by Buff & Shine! Marine 31 Wool Buffing & Polishing Pads are available in three types of wool to complement the performance of Marine 31 boat compounds, cleaner waxes and metal polishes. 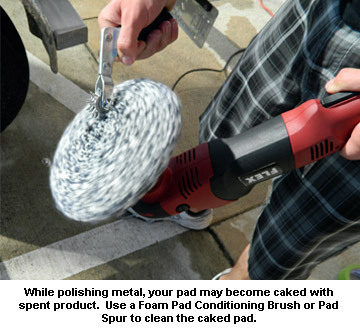 Our wool pads power through oxidation, eliminate stains, and restore a mirror shine to gel coat, paint, fiberglass, aluminum and other bare metals. Boats, wheels, trim, trailers, and RVs will shine like new! Marine 31 Wool Buffing & Polishing Pads were developed through a partnership between Buff & Shine and Palm Beach Motoring Group to provide the most effective method of application for our Marine 31 polishes, compounds and cleaners. Each pad has a different level of abrasiveness and is designed for a different task. Buff & Shine has made three distinct types of wool pads to maximize the effectiveness of our Marine 31 compounds, polishes and cleaners. Two pads here are made with twisted wool, which is a compounding material. Among twisted wool pads, pads with shorter threads are more aggressive than those with longer twisted threads. Therefore our 4 Ply 100% Twisted Wool Compounding Pad has shorter threads than the 50/50 Acrylic Polishing Pad. The Final Polishing Pad is made of soft, fluffy, electrified wool. This wool is not twisted at all and is therefore gentler on the paint. The Final Polishing Pad is a gloss-enhancing pad. Each strand of high grade wool is tightly twisted to maintain a consistent level of cut for longer periods of operation. The thick yarns remove heavy oxidation and stains from neglected or never-before-polished metal surfaces. The pad feature over 1 inch long threads. This pad was developed for gel coat but is also very effective on aluminum and stainless steel as well. Available in 6.5 and 7.5 inches. This wool pad has 50% 4 ply wool and 50% single strand wool/acrylic blend. This combination makes a light compounding/polishing wool that removes minor oxidation, haze, dullness, and spots. The 50/50 pad has 1 � inch twisted threads, which are less aggressive than the shorter twisted threads found on the compounding pad. Available in 6.5 and 7.5 inches. The Electrified Sheepskin Final Polishing Pad is made by electrifying the wool to remove microscopic barbs naturally found in wool. The resulting wool is soft enough for final polishing with a shine enhancing polish. This wool pad has 1 inch threads. Available in 7.5 inch size. Marine 31 Wool Buffing & Polishing Pads are available in 6.5 and 7.5 inches. Both sizes are for use with a circular polisher equipped with a 6 inch rotary backing plate. 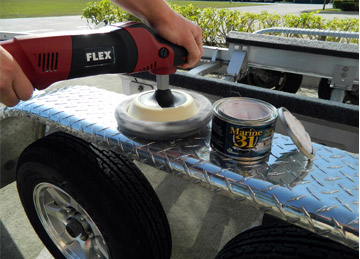 The 6.5 inch pads can be used on your FLEX XC3401 or other dual action polisher, with a 6 inch DA backing plate, or on a rotary with a 6 inch rotary backing plate. All pads have Velcro� brand hook and loop fasteners. User tip: When using a wool pad, do not use a pad conditioner as you would on a foam pad. Wetting the wool will flatten it and make it less effective at removing blemishes from gel coat and metal. Polishing gel coat of aluminum is a messy process. Depending on how oxidized the surface is, you may need at least 1 or 2 additional wool pads on hand. Fluffing the pad periodically will help but, when the pad becomes absolutely black from the oxidation residue, it is best to switch to a fresh pad. Immediately put the used wool pad in a bucket of pad cleaning solution and water to soak. It�s virtually impossible to remove these residues after they�ve dried within the wool. For directions on using each pad, refer to the directions of each metal polish. 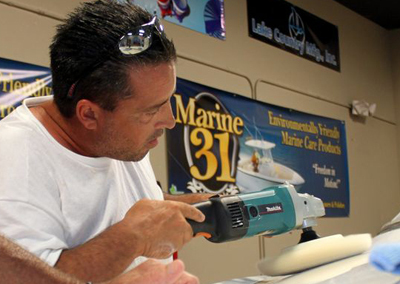 Enjoy the best performance and results from Marine 31 polishes with Marine 31 Wool Buffing & Polishing Pads.